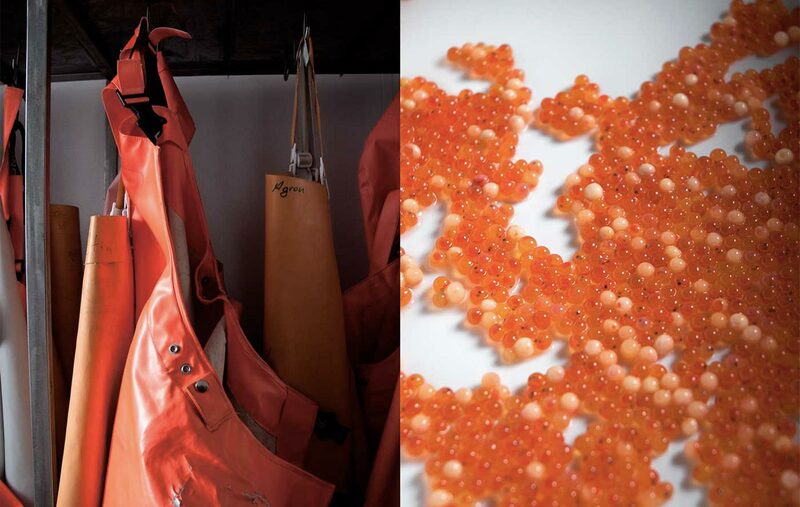 Olivo Armanini decided to start his fish hatchery next to the Tedeschi Bridge in Storo in 1963. The City Hall leased him a parcel of unused riverbed of the Chiese River, which provides running water, an essential requirement for healthy fish. In the beginning, his fish were especially lucky to be able to feed on plankton, which is rich in nutrients. Fishing for trout is one of those pastimes here that almost everyone enjoys; the river is so rich in life and fish, it’s nearly impossible to leave without at least one bite. Furthermore, Italy is a country that is just beginning to fully appreciate the word “hobby;” interest in trout fishing is growing. Olivo’s philosophy was to give the fish time—that is, never rush their natural growth. Even when the construction of electric plants diverted the river water, killing the plankton and necessitating the use of fish feed, Olivo’s pace remained true to their natural growth: eighteen months for trout, twenty-two for char. Pushing growth time would mean compromising quality for quantity. Olivo and his wife Santa’s three children, Andrea, Miriam, and Francesco, maintain their father’s philosophy. In the picture, he poses with a monster of trout weighing in at 7.3 kg (16 lbs). 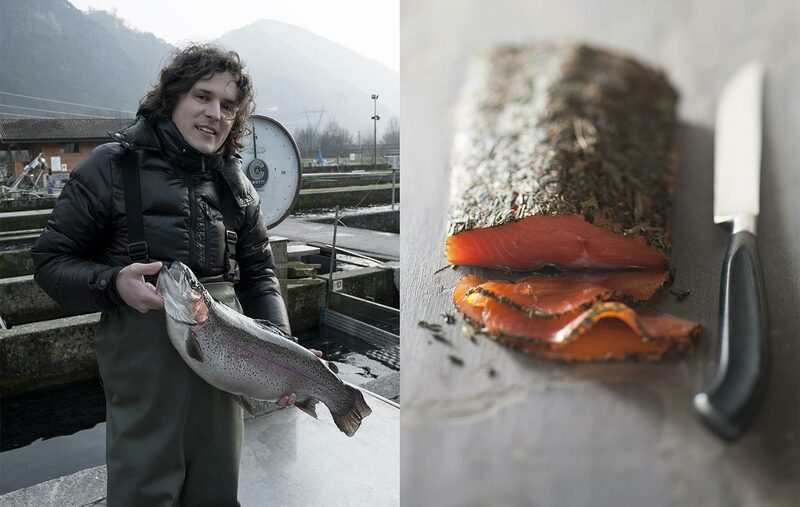 Francesco knows intuitively that raising excellent quality trout and char is not enough; the fish can and should be valued and made to last, so that even those less enthusiastic about going fishing can enjoy the fruits of the river. It was a short step from this market need to smoking the catch. The family company grew from one hatchery to four, all nearby the river with abundant running water sources. Everyone in the family plays a special role in the business. The development of the fingerlings, or young fish, is crucial, and their growth is followed so attentively that it almost feels maternal. Once the fingerlings outgrow the dangers of diseases at this young age, like a child outgrows the threats of measles and chicken pox, they are naturally resistant and grow healthy and strong. The year-round provision of running water is a deciding factor in the health of the char, which, together with the length of time for breeding, contributes to entirely eliminating the need for antibiotics. The company often dreams of becoming organic. In fact, the hatchery in nearby Biacesa already has its cards lined up; unfortunately, the reality is tougher than the dream. The costs of certification are practically penalizing because organic fish feed in Europe is only produced by one Norwegian producer. Using it would raise the cost of production by 40%. There is no guarantee the market will pay for the difference for this artisanal product that, among other considerations, is time limited. Like many food artisans, the Armanini family finds itself facing a paradox: being sustainable is, in fact, unsustainable. Time passed surprisingly quickly, and the Armanini family arrived in 2013. It was time to celebrate the 50th anniversary of the company! And thus “Trout Speck” was created, a smoked delicacy dressed in organyc aromatic herbs from Monte Baldo in Trentino with a sweetness that comes from the smoky notes. We have, of course, tasted it for you. Our verdict? Incredibly good. The secret, of course, lies with papà Olivo: never rush time.